Next in the series on Nomad Grass-Fed Beef Jerky is this Chipotle Curry variety. See our other review of their Black Pepper beef jerky. Nomad Grass-Fed Beef Jerky is a relatively new brand based out of West Des Moines, IA. The company was founded by Bill Van Werden, who had been making jerky for 15 years for friends and family. The recent "Paleolithic Diet" caused Van Werden to focus on using grass-fed beef, sourced from cattle in Dorchester, IA. Thus far the company produces only two flavors, this Chipotle Curry, and the Black Pepper I reviewed earlier. While known more for their beef jerky, Clint & Sons markets their own line snack sticks too. The company, based in White Deer, TX, goes back to 1944 when Clint Freeman opened it up. Today it's run by his sons and grandchildren. The company recently upgraded from state inspection to federal inspection, allowing them to sell meat snacks across all 50 states. These snack sticks come in three flavors, Original, Jalapeno, and Honey Ham. The Original and Jalapeno are a blend of beef and pork, while the Honey Ham is all pork. Next in the series on Crazy Cow Jerky is this Teriyaki Ginger variety. See our previous review of their Spicy Hot Ginger beef jerky. This Teriyaki Ginger is described by the company as "Savor the unusual delight of natural ginger in our Teriyaki ginger Beef Jerky". Beef sticks fit perfectly as stocking stuffers, or you can buy a whole box and wrap it as a present. Imagine the smiles on their faces when they find a whole box of Pap's Beef Sticks! Pap's are made with 100% beef, no fillers, no artificial ingredients, just ALL beef. Make an online purchase of any 24 count box of Pap’s Beef Sticks or Triple Pack of Poppers Beef Stick Nuggets and receive a Beef Stick Sampler Pack FREE (that’s a $6.99 value). What an easy way to give a great holiday gift and get a little holiday bonus yourself! Don’t miss it; Christmas only happens once a year! So make it a Pap's! Next in the on-going series of The Jerky Connection is this Satan's Flaming Hemorrhoids variety. See our other reviews of The Jerky Connection. Described by the company as "sweet and savory and devilishly hot", Satan's Flaming Hemorrhoids is made with Ghost Peppers, Powdered Trinidad Scorpion, Trinidad Scorpion purée, and a "secret weaponized hot sauce" they like to call "Preparation-S". Finishing up with the series on Jimmy's Sticky Jerky is this Sticky Fire variety. See my original review of their Sticky Sweet beef jerky, and their Sticky Heat. Jimmy's Sticky Jerky is a new jerky brand launched in September 2012. It's the creation of Jim Nielsen, based out of Hermosa Beach, CA. Nielsen claims his love for jerky goes back to when he was just a fetus, and his mother had been snacking on the stuff while she was pregnant. 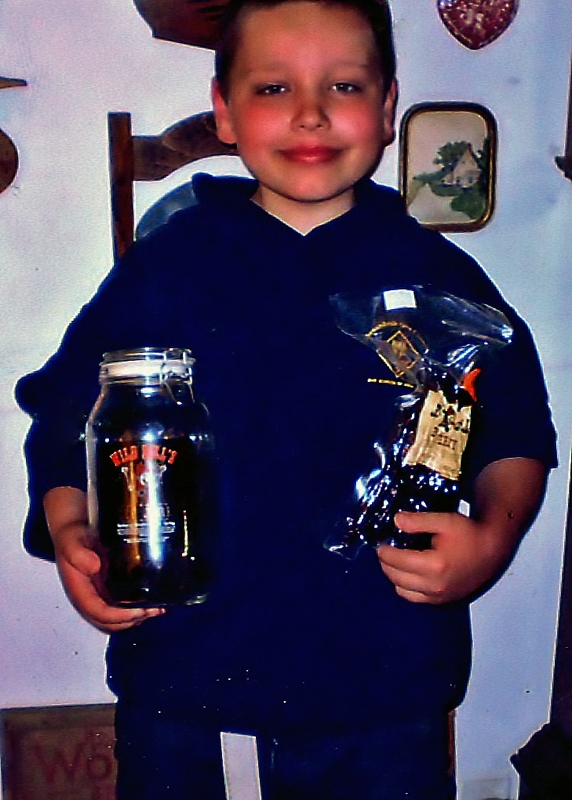 Just 10 ten years ago, he started making his own jerky, and was encouraged to go into business by his closest friends. This Sticky Fire variety builds on top of its Sticky Heat brethren of red, jalapeno, and habanero peppers, and adds ghost pepper chiles to create an even hotter experience. The brand's jerky is made from top round beef and contains no preservatives, MSG, or "unpronounceable ingredients" as McPherson states. They currently offer five flavors, including their signature flavor "Cowafornia", which we'll be reviewing later. This Spicy Hot Ginger variety is described by Crazy Cow as being "perfect for those that want a little tingle on their tongue". Next in the series on Clint & Sons Beef Jerky is this Smoked BBQ variety. See reviews of more flavors from Clint & Sons Beef Jerky. This Smoked BBQ variety is described as a slow smoked, tender barbecue jerky with just a hint of honey sweetness." 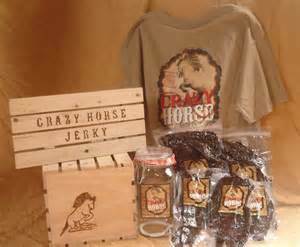 Best jerky in any house delivered to your house for 12 months! Bundled up beside a cozy holiday fire, walking along a sunny springtime trail, fishing beside a crystal clear lake in July or raking leaves in late autumn. . . times to enjoy some peace and quiet, and perhaps a snack. A package of jerky would taste pretty good right now, yes Sir! But not just any jerky. That gourmet jerky you tried and you just couldn’t get enough of. For the meat snacker in your life who enjoys “Only The Best”, House of Jerky 12 Month Most Unique Jerky Club makes the perfect gift. 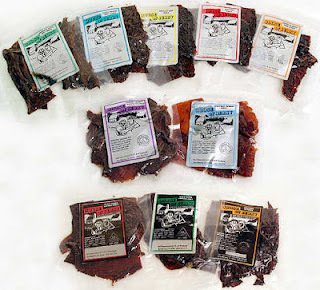 For just one payment of $150 you will receive 12 shipments of seriously delicious and tender jerky. This collection, a wide variety made from top round of Beef, Pork, Venison, Buffalo, Turkey, Wild Boar & Alligator. Healthful, savory and tender, each and every piece is guaranteed to have no preservatives and no MSG, and will be a gift that is sure to be remembered. 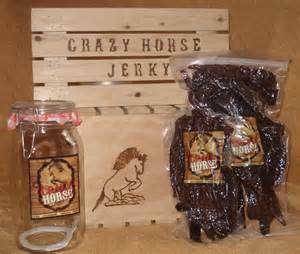 To start the tradition today, visit House of Jerky - Jerky of the Month to order. Next in the series on Jimmy's Sticky Jerky is this Black Pepper variety. See my previous review of their Sticky Sweet beef jerky. Jimmy's Sticky Jerky is a new jerky brand launched in September 2012. It's the creation of Jim Nielsen, based out of Hermosa Beach, CA. The concept of "sticky jerky" is based on the stickiness of the marinade Nielsen uses. He makes all the jerky himself, trimming, slicing, and packaging the stuff. He currently sells it at farmers markets and a handful of local stores around Hermosa Beach. This Black Pepper variety is said to be made with fresh-cracked pepper, claiming to be full of sweet, savory, and tangy flavors. Moving along in the series on The Jerky Connection is this Hillbilly Campfire beef jerky. See our previous review on The Jerky Connection. This Hillbilly Campfire variety recreates that scene of woodsy outdoorsmen smoking their meat over a campfire. It brings in layers of mesquite and hickory smokiness. Next in the series on Hi-Country Beef Jerky is this Honey Kist TenderSlice Strip Style jerky. See last week's review of their Original Flat Style. Hi-Country Beef Jerky is a brand of Hi-Country Snack Foods, Inc. based out of Lincoln, MT. The company started out in 1976 strictly as a beef jerky manufacturer, then as sales increased, they added beef sausage to their line up. The company makes jerky from their own USDA inspected facility. This Honey Kist flavor is described by Hi-Country as "a delicious twist on our Original recipe with a kiss of honey." QuarterShare is a new brand of meat snacks launched this year based in Tulsa, OK. It's the creation of Richard Cranford, a medical device manufacturing executive, who had built a reputation for supporting charitable causes. Ready for a new challenge, Cranford launched QuarterShare, a beef stick brand that donates 1/4 of its profits to charities. It also donates a beef stick for every four beef sticks sold to local food pantries and after school programs. QuarterShare comes in three flavors, Original, Smokey Sweet, and Jalapeno Pepper. They are sold in stores in the Tulsa, OK area, as a fundraising product through a wide variety of groups, and soon from their website. "Since I was 5, I've been saving a dollar for a piece of jerky out of the jar. But they took the Wild Bill's out of the store I buy it from and now I can't get it there." 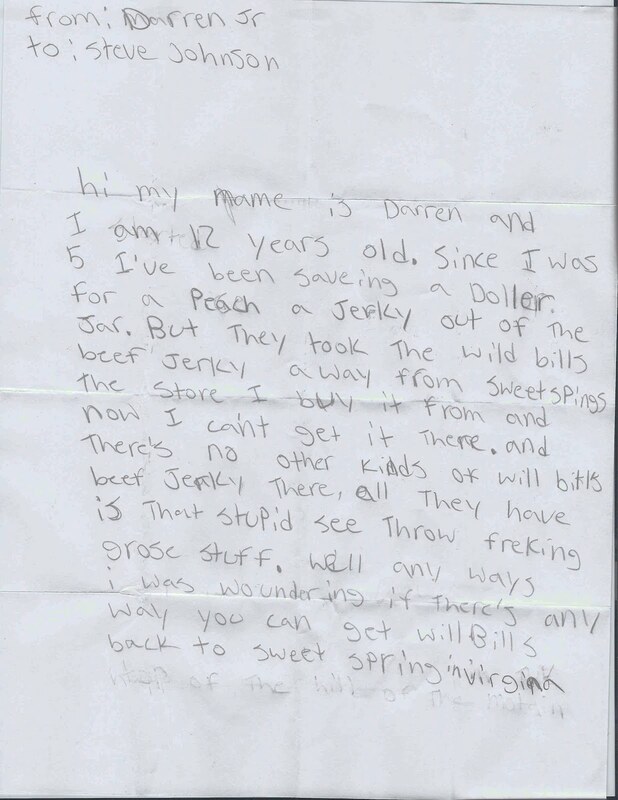 We received this hand-written plea from Darren Jr. of Harpers Ferry, WV recently. The letter was addressed to Steve Johnson, publisher of Best Beef Jerky. Darren Jr. had found our review of Wild Bill's Beef Jerky online. 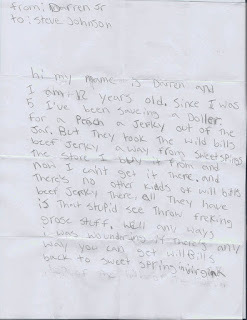 Being a "Man-of-Action" Darren Jr. wrote this letter in hopes of bringing his favorite beef jerky back to his local market. At Best Beef Jerky we sprung into action and contacted Kim Olivito, Social Media Manager of Wild Bill's Jerky. "I'll get this letter to Wild Bill right away!" Kim expressed. "He's a Man-of-Action too!" Within a week Darren Jr., known by his family as Chuck, received a package from Wild Bill. Inside was two packages of Wild Bill's Beef Jerky and a Wild Bill's Jerky Jar to have for his very own! "My Dad's name is Darren too so he thought it was for him. When he opened it up he saw the name Wild Bill and said, 'Chuck, this is for you.' When I saw the 2 packages of beef jerky and the awesome jar, I almost went through the roof! That beef jerky is the best in the world, no doubt about it. That was the best early Christmas present I ever got. Thank you so, so, so, so much. I could never thank you enough!" Thank you Chuck and thank you Wild Bill! Good things come to "Men-of-Action"! And it's like we always say here at Best Beef Jerky, "The man if your life wants the gift of jerky! Really! He does!!" Perfect stocking stuffers for Christmas are these set of "limited edition" chocolate covered beef jerky offered by The Jerky Connection. The three varieties: "Santa's Flaming Sleigh Ride", "Rudolph's Reindeer Tracks", and "Chocolate Snow", starts with The Jerky Connection's famous beef jerky, and then coats them in a variety of decadent sweet chocolate. Run by Tom Greineder, The Jerky Connection is a new business that launched last June, based out of Wrightsville, PA, boasting several jerky flavors ranging from mild to insanely hot. Next in the series on Dried and True Beef Jerky is this Sriracha Lime variety. See our other reviews of Dried and True Beef Jerky. Dried and True is a brand of all natural, artisan beef jerky based in Venice, CA. The brand was launched in August 2012 by Matt Lauster. The brand has managed to create a following around Venice, selling out at local farmer's markets and specialty stores. This Sriracha Lime is made from Lauster's homemade Sriracha sauce made and boosted with Thai chiles, fresh garlic, and a tangy citrus finish of lime. Moving along in the series on Jimmy's Sticky Jerky is this Sticky Heat variety. See my original review of their Sticky Sweet beef jerky. This Sticky Heat variety says it adds fresh red, Jalapeno, and Habanero peppers into the marinade, claiming to give it a clean, but hot flavor that doesn't burn the mouth, but adds a bit of heat and spice. Next in the series on Gunslinger Jerky is this Smoke variety. See my previous review of their Cowboy Coffee jerky. Gunslinger Jerky has been selling in the Chicago, IL area for about a few years now. It's the creation of Dustin Miller and his wife Ashley. The brand, which bills itself as "Chicago's original rock 'n roll jerky company", is sold in several bars where the city's music scene thrives late into the night. This Smoke variety is billed as "Beer infused, hickory and toasted spices". Hi-Country Beef Jerky is a brand of Hi-Country Snack Foods, Inc. based out of Lincoln, MT. 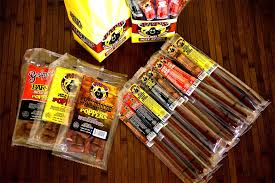 The company started out in 1976 strictly as a beef jerky manufacturer, then as sales increased, they added beef sausage to their line up. Eventually they grew to include several other brands including Hi-Country Meat Snacks, Hickory Kist Meat Snacks, Hi-Country Trading Post, and Montana Pet Foods. Later they went on to include jerky marinades, rubs, brines, and seasonings. Hi-Country makes beef jerky in their own USDA inspected facility. They offer four meat styles, "Flat Style", "TenderSlice Strip", "Ranch Steak", and "Pucks". This Original flavor I have is from the Flat Style. Jimmy's Sticky Jerky is a new jerky brand launched in September 2012. It's the creation of Jim Nielsen, based out of Hermosa Beach, CA. Nielsen claims his love for jerky goes back to when he was just a fetus, and his mother had been snacking on the stuff while she was pregnant. Just 10 ten years ago, he started making his own jerky, and was encouraged to go into business by his closest friends. The concept of "sticky jerky" is based on the stickiness of the marinade Nielsen uses. He makes all the jerky himself, trimming, slicing, and packaging the stuff. He currently sells it at farmers markets and a handful of local stores around Hermosa Beach.